← Referendums, referendums … but what are they all about? The 1919 Declaration of Independence is almost always overshadowed, whether by the more poetic and celebrated 1916 Proclamation of Independence or by the mere fact that on the day the Declaration was made, there was a parliament in Ireland for the first time in 120 years. It is not altogether surprising, then, that Monday’s centenary celebrations focussed more on the anniversary of the First Dáil and the beginning of the War of Independence. It is not altogether surprising that although a commemorative video was made in 2016 in which the descendants 1916 signatories re-read the Proclamation, the same tribute was not made in respect of the relatives of the 27 parliamentarians who were present in the Dáil to make the Declaration (let alone 39 others who were absent for reasons of imprisonment and forced exile and not to mention the remaining 39 who were absent for other reasons). 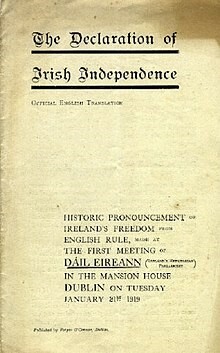 Still, the 1919 Declaration of Independence, supported by the Message to the Free Nations of the World and the Democratic Programme, is worthy of at least as much attention as the 1916 Proclamation, if only for the reason that it is the declaration of independence that, accompanied by a more successful guerrilla campaign, secured enough legal and political freedom for Ireland that She could procure the rest herself. Four features of the Declaration stand out. First, the 1919 Declaration does what every declaration of independence has to do: it paradoxically and unilaterally asserts political and legal freedom on the basis that that freedom already inheres in the people in whose name the declaration is made. The 1919 Declaration does this in a particularly pithy way, opening with the words “the Irish people is by right a free people” (a statement clearly contradicted by the blunt reality that Ireland was being governed from London) and going on to insist that the Irish people “never ceased to repudiate” their freedom (a debatable point: parliaments in Kilkenny in 1366 and Drogheda in 1494 acknowledged the primacy of English law in Ireland, although without a democratic mandate and to no great effect). Being already a free people, at least according to the Declaration, the Irish people affirms this freedom through the declaration, resolving “to secure and maintain its complete independence”. This is the necessary illegality and the logical paradox that takes place at the founding of every state: you assert the authority that you want to have on the basis of an assumption that you are already entitled to that authority. The third feature, which is characteristic of declarations of independence from around the world, is that the declaration promises a new dawn, in which the common good will be promoted, justice restored and defence secured. In order to achieve these ambitions, the Declaration requires the evacuation of English garrisons, the cessation of foreign government, but most importantly, the primacy of the Irish parliament. The declaration is unequivocal in its insistence that “the elected Representatives of the Irish people alone have power to make laws binding on the people of Ireland, and that the Irish Parliament is the only Parliament to which that people will give its allegiance”. This uncompromising position is later reiterated in Article 12 of the 1922 Constitution (“The sole and exclusive power of making laws for the peace, order and good government of the Irish Free State is vested in the Oireachtas.”) and Article 15 of the 1937 Constitution (“The sole and exclusive power of making laws for the State is hereby vested in the Oireachtas; no other legislative authority has power to make laws for the State.”) These words cannot now be interpreted literally using the spirit of patriotic fervour which inspired them since that interpretation is belied by the political reality that parliament is institutionally weak and does not have exclusive legislative authority. Fourthly, the 1919 Declaration of Independence, again in a manner that is typical for declarations of independence generally, appeals to higher authorities, viz., the international community and Almighty God. By securing recognition for the newly-emerging state from the international community, the hope is that the British will be intimidated by the understanding that denying Irish independence will cost them the goodwill of other nations. 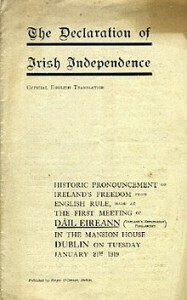 It was for this reason that the 1919 Declaration was issued in French, as well as Irish and English, and accompanied by the Message to the Free Nations (also issued in French, Irish and English) which ends with the stinging exhortation to the nations of the world “to uphold [Ireland’s] national claim to complete independence as an Irish Republic against the arrogant pretensions of England founded in fraud and sustained only by an overwhelming military occupation” so that “the civilised world having judged between English wrong and Irish right may guarantee to Ireland its permanent support for the maintenance of her national independence”. It is in the way that they appeal to God that the essential difference between the 1916 and 1919 texts is illuminated. The 1916 Proclamation ends by placing the cause of freedom “under the protection of the Most High God” – a pretty standard invocation – but it goes on to pray not for success or victory or minimal loss of life, rather that “no one who serves that cause will dishonour it by cowardice”. It extols the need that Ireland’s children must be willing to “sacrifice themselves” so that the nation can live and “prove itself worthy of the august destiny to which it is called.” The final paragraph of the 1919 Declaration begins with a similar invocation, in the line “we humbly commit our destiny to Almighty God who gave our fathers the courage and determination to persevere through long centuries of ruthless tyranny”, but ends with the more confident assertion that the blessing sought is to guide “this the last stage of the struggle” for Ireland’s freedom. The expectation this time is that Ireland’s freedom will be safely secured. Dr Maria Cahill is a lecturer in constitutional law at University College Cork. This entry was posted in Constitutional History. Bookmark the permalink.